General Casimir Pulaski’s monument and tomb is a well-known Savannah landmark that holds a secret. Researchers from Georgia Southern University have solved a mystery about this hero of the American Revolution and revealed something even stranger. The story behind this historic mystery is revealed in Smithsonian Channel’s documentary, “America’s Hidden Stories: The General Was Female?” A screening of the 50-minute film was held on the Armstrong Campus on April 3 at 7 p.m. in the Ogeechee Theatre in Student Union. Following, there was a Q&A panel session with members of the investigation team, including Georgia Southern Assistant Professor of Anthropology Virginia Hutton Estabrook, Ph.D., graduate student Lisa Powell and her father, historian Chuck Powell, who was a member of the original Pulaski Monument research investigation team 23 years ago. Smithsonian Channel Executive Producer Tim Evans served as moderator. 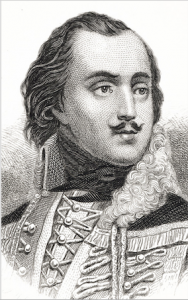 The unsolved case of American Revolutionary war hero Casimir Pulaski’s whereabouts eluded historians for more than a 150 years: was the “Father of the American Cavalry” buried at sea or in an unmarked grave in Savannah, Georgia? In 1996, when permission was granted to study remains within the Pulaski Monument in downtown Savannah, new evidence stumped scientists at the time, as their findings suggested that the skeleton in the tomb looked biologically female. Was this the case of a misidentified skeleton or was Pulaski an intersex American Revolutionary war hero? Lisa Powell and Estabrook first crossed paths as student and professor on the Armstrong Campus in 2015 in a serendipitous meetup. It was Estabrook’s first year teaching on the Savannah campus, and she had just inherited custody of the remaining Pulaski bone samples from the 1996 investigation that had been dropped due to a lack of funding for further DNA testing and a qualified team to finish the work. At the same time, her student, Lisa Powell, was given her father’s boxes of notes and materials from the original case. Soon, the two joined forces to resurrect and reanalyze the data, including notes and analyses of Pulaski’s skeletal remains from the late Karen Burns, Ph.D., a forensic anthropologist from the University of Georgia. Smithsonian Channel soon jumped on board, assisting with funding for costly ancient DNA lab work specializing in difficult testing samples. The team, which also included Megan Moore, Ph.D., associate professor of anthropology at Eastern Michigan University, researched medical literature about intersex conditions in search of patterns of skeletal involvement that might be similar to the Pulaski Monument remains and for any comparative known intersex condition skeletons in collections worldwide. Lisa Powell and a local Savannah archaeologist, Daniel Elliot, analyzed the metal content of two Revolutionary artillery grape shots in Savannah and Charleston, which were donated by the grandson of a Revolutionary War surgeon who claimed each was the shot that killed Pulaski; and Estabrook visited the Federal Archives and Library of Congress, as well as the Maryland Historical Society Library to research primary source documents related to the time of Pulaski’s death. Now working toward a Master of Arts in Social Science with a focus on archaeology and anthropology, Lisa Powell is excited to share the team’s revelatory findings with the public. As such, a chapter in American history is forever changed. This event was co-sponsored by Georgia Southern’s College of Behavioral and Social Sciences and Department of Sociology and Anthropology, and Smithsonian Channel. For a sneak peek of Smithsonian Channel’s “America’s Hidden Stories: The General Was Female?” episode, click here. “America’s Hidden Stories: The General Was Female?” premieres Monday, April 8, at 8 p.m. on Smithsonian Channel, and runs throughout the month.